To see why this answer is so, think about the place value of digits and look at the following list, which shows the numbers in the above equation. As you can see, that little zero makes a big difference, because it causes the rest of the numbers to shift over one place. This concept makes even more sense when you think about the decimal point. 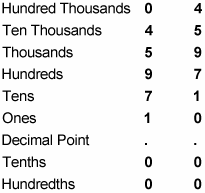 See the following list showing the result of shifting the numbers over one place. In this case, the net effect is that you moved the decimal point three places to the right, which is the same as multiplying 7 by 1,000. This time, the net effect is that you moved the decimal point three places to the left, which is the same as dividing 7 by 1,000.